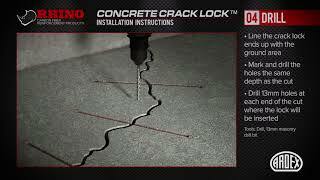 The Rhino Concrete Crack Lock (CCL) is a revolutionary new product that was developed to improve concrete crack repair. The CCL is installed by making a single blade-width cut across the crack and drilling two holes along the cut at the appropriate locations. Once the preparation is complete and free of dust, it is filled with an approved ARDEX Epoxy Paste such as ARDEX RA 88 (for vertical applications) or ARDEX RA 142, ARDEX RA 144 or ARDEX RA 146 (for horizontal applications) and the CCL is inserted. Once installed, the CCL permanently bonds both sides of the crack together. Due to the unique shape of the CCL and the preparation in the concrete, the tensile strength of the carbon fibre is relied upon as well as the epoxy bond strength along its length. The Concrete Crack Lock has been engineered to stop cracks in concrete slabs, poured walls, masonry, concrete block foundations, columns, industrial buildings, bridges, and foundations. The CCL System is designed for cracks of various sizes under virtually any circumstance. It can also be used to increase seismic strength to repairs after an earthquake.